Five Rules for Making Great Grilled Pizza Outdoors on the 4th of July, With Red Star Platinum Yeast: NEW VIDEO! 3. Bake the first side of the crust “blind” (without toppings) for about three minutes, then flip and top. Prep all your toppings in advance. 4. Cut the cheese into small cubes, or grate it so it melts fast, before the bottom crust burns. That way, after flipping and topping, the pizza will be finished in five to ten minutes, depending on burner heat and position under the pizza. Living in Hawaii, we grill all year round. Grilled pineapple, Kalua pork, and sweet Maui onions make a very nice pizza indeed. What is the difference between using regular Red Star granular yeast and the Platinum yeast. They’re both terrific products, and both work extremely well in our recipes. 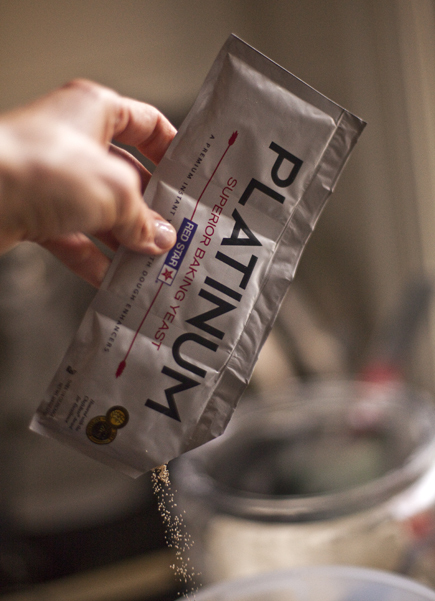 The Platinum is their premium products and it contains some dough conditioners, which enhance the rise. Some of the dough conditioners are derived from wheat proteins, so this isn’t for people who are gluten-free. Thanks for the info. I will have to try it to see if I notice the difference. Has anyone found the Platinum yeast in Atlanta? I’ve checked the larger stores of Publix and Kroger in the Atlanta Area and have not been able to find it. Perhaps we can add a “dough improver” to our regular instant yeast? Some people like the addition of a little ascorbic acid as a dough conditioner/yeast enhancer, but I haven’t tried it so can’t recommend it. Thanks for the video, and this time I got the pizza throw! Yesterday (Happy Fourth!) was about 8000 degrees 🙂 here in Brussels, but today is a typical drizzly day just in time for the Fourth of July fireworks at the American School. Oh well! But my grill pizza party will be a success when the weather gets better. Being an old school charcoal grill guy, does this work over charcoal? It does work, but it takes some playing with to get the coals just right so the dough doesn’t burn. If your grill is big enough, maybe try pushing the coals off to the side, so the dough isn’t directly over the hottest part of the grill. It looks great. Love pizza on the grill. The tossing technique was good info. Like the tomato info also. Will be trying both this weekend. Having trouble with wetness with both the master recipe in Artisan Breads and Healthy Breads. I’m measuring & weighing carefully but after refrigeration my dough is so wet that I can’t cut a hunk off — it just falls apart. Very hard to form a ball, and to cut slashes after resting. The bottom of the bucket has a pool of liquid. When I get to the 4th baking for the dough, there is so much liquid that I mixed in over a cup to get a cohesive dough (that bread came out perfect, though.) I’ve used various supermarket unbleached white flours and Hodgkin Mills whole wheat. Help! Have you seen any of our videos? If so, does your dough seem wetter than ours? Here is a video on shaping very wet dough: http://artisanbreadinfive.com/2010/03/08/new-video-shaping-the-ball-from-a-very-wet-dough Let me know if your dough seems wetter than the one in this video. Are you making any substitutions? One of the things I love about the AB5 method is that you don’t have to worry about exact measurements. Instead of worrying about exact measurements, just go by how it looks and feels. The video is a great reference tool! Even when I use the scale I often find a need to add a little more water or a little more flour depending on the look of the dough. It all comes out tasting great! Sorry, you did mention it had steam. I have actually tried starting with a cold oven and it worked just fine. Give it a try and see what you think. I did it inside of a clay cloche, but I bet the results will be similar in your oven. Hi! I’ve been making your basic bread recipe for awhile now but always wondered why the bread doesn’t last very long. I bake it and the bread is perfect that day out of the oven but the next days seems extremely hard. I end up wasting so much because of how hard it gets. Anything I can do to fix this problem!? Thank you! Which loaf are you making? The breads with white flour tend to stale faster than those with whole grains. Adding honey, eggs, and fats also help keep a loaf longer. Any bread that doesn’t have additives will stale pretty quickly, so you may want to make smaller loaves. Thanks so much for your response! I’ve just been making the master recipe. Anything I could add to that recipe for a softer bread? If it is a softer bread you are looking for, I would try the challah or brioche. They are both enriched and will have a softer crust and interior crumb. I keep seeing the comments for the new Platinum yeast, but we can’t find it anywhere here in our area of California. I did just click on the link you had for Amazon but they just have the regular Red Star Yeast. Any help on where the Platinum is really sold out in CA? Looking for some in Atlanta, Georgia too. A couple years back you had recipes in the Cooking Club Magazine. I have been trying to locate those recipes, but without success. Is it possible to post them here? I’m mostly interested in the rosemary green olive buns, but If I can get them all that would be great too. I attempted a search on their website, but it seems you have to be a member to log in and search. Are you able to help me? I’d greatly appreciate it if you are. Right, Cooking Club never posted those online. We post a limited subset of recipes here on the site, but not all of them (our publisher would kill us!). Tell me which of our books you’re working out of, and I’ll try to explain how to do the rosemary olive variation. Well I have a copy of the magazine, but its in storage. I have your first three books also, but in storage too. That’s why I was trying to get help here. Really, I just need the measurement of olives and rosemary so I don’t put too much/ too little of either. Maybe I can manage the rest and use a basic boule dough. Oh, I forgot about that article, those buns were tasty. Here is a post with something close to them: http://artisanbreadinfive.com/2011/09/21/rosemary-crescent-rolls You can just add up to a cup of chopped olives, depending on how much you like olives. Don’t add any additional salt, since the olives are salty. You can make them as they are in the post or just regular buns. In this article, you say grilled pizza must be made with “lean” dough. Does this mean any bread which isn’t in the “enriched breads” section? I’d like to try with the vermont cheese dough and am wondering what can go wrong if the dough isn’t “lean” enough.. Correct, not challah or brioche-type doughs. The Cheddar should probably work, but my only concern is whether some cheese might leak out and burn on the grates. Worth a try though– maybe first time do it as a flatbread without toppings in case it’s a disaster? Tried it as a flatbread and it went geat! No sticking to the grates, no cheese leaking, well cooked, and since the dough was almost a week old, VERY flavorfull. One of my fave doughs. Fantastic, should be great as a pizza then. Zoe I have now tried using the steam convection oven without pre-heating it and it worked just fine and now I can actually use the oven to proof the dough. I made a batch of dough with olive oil for olive bread and when I covered the bread as you suggested with a metal bowl the dough stuck to the sides as it had risen quite a bit and when I went to put is in the oven it flattened out considerably the bread was fine but much flatter than the round loaf. Any thoughts? Any chance you over-proofed it in the warm steam environment? That’s what it sounds like. When you made the olive free-form loaf with a more traditional room-temp proofing, did you get a fuller, less flattened loaf? If so, you could just try a shorter steam-proofing. 100 degrees is definitely warmer than the environment we proofed in when we tested the recipes. I think that’s it. This wet dough is less structured than traditional, and I think it basically “runs” at that temperature. I made pizza dough from the Master Recipe, Kindle edition, Artisan Bread in 5. I put the leftover dough in a partially sealed plastic bag and refrigerated it,and about a week later made a pizza. The dough tasted like there was an alcoholic fermentation going on in the bread. What went wrong? It made a crisp crust but tasked like there was ethanol in the mix. I thought the dough was to improve with age? Check our suggestions in the 2013 edition of that book under “My dough has a strong yeast or alcohol smell. Can I use less yeast?” In the print edition, that’s on page 45, in the Tips and Techniques chapter. If you have the first edition of the book (2007), it’s not in there, so check out our FAQs tab above and click on “Yeast: Can it be decreased in the recipes?” If you have the 2007 edition, first thing I’d do is decrease the yeast to 1 tablespoon. You’re already venting the container, so if none of the other suggestions work, and you’re not crazy about the aroma in 7-day dough, I’d suggest using it before 5 days, and freezing it thereafter. Hi Guys! Have you seen the pizza article in the Spring 2015 issue of Lucky Peach? It’s about creating a more flavorful and easily digestible pizza dough by fermenting the dough. I am totally intrigued with this idea, because I think it has significant health benefits. The complicated recipe, which I want to try, is a 10 day process that uses 3 starters (overnight fermented poolish, same day poolish, and a natural leaven) and a daylong batch fermentation. As I imagined myself forgetting to feed the poolish daily, I realized this would be an awesome recipe for you guys to simplify! Please check out the article and tell us how to ferment our 5 min. a day dough! Thanks! Chad’s a great baker, but his recipes are not simple at all. Our method dispenses with all that, and gives you some sourdough character in the dough through long storage. Also, can’t view the article without paying, but I’ve seen enough of Chad Robertson’s recipes to know that they are fantastic– but that most busy people won’t have time to do them. Just try the dough recipes in any of our books– click on the book images above, one of the books is pizza and flatbread-only. Have you had luck with the “blind” method in the oven? This seems like it would make the dinner party with pizza idea go smoothly. Thoughts? I find that blind baking the dough first makes for a dry pizza crust. However, we’ve had many readers say they really like that method, so I would give it a try and see if you like it. We opted for the grilling technique and it turned out wonderful and a bit crispy. They were a hit for everyone there. And it was very easy, definitely will be a repeat thing for us! Thanks for this post!